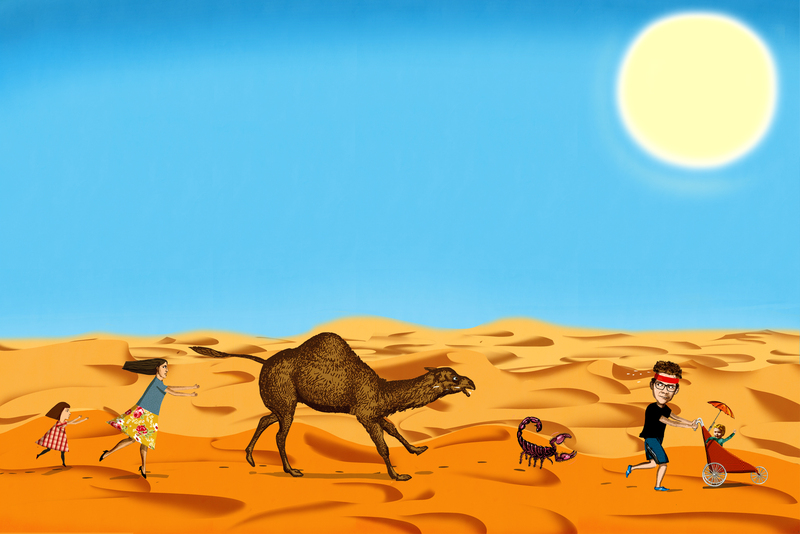 I may need to sell a kidney to pay for all the kit I’m told I need for the Marathon des Sables [MdS], which I’m running to raise funds to help end the misery of type 1 diabetes (why not donate here?!). It’s nuts. I once thought all a runner needs to rack up long distances over inhospitable terrain is a pair of working legs, a loose screw or two and a fetish for lycra. Wrong. The MdS mandatory kit list seems as long as the race itself. For good reason. A snake venom pump, one of those legionnaire’s sunhats, 14,000 calories of food, etc, etc, could be the difference between success and failure (or life and death) when running 150 miles across the Sahara Desert. But one bit of kit is at the top of my list: my insulin pump. First, the basics. Type 1 diabetes occurs when the immune system kills the cells in the pancreas that produce insulin, the hormone that allows the body to draw glucose from blood to use as fuel. Without insulin you’d be dead in a fortnight. So, diabetics inject the stuff, either with hypodermic pens or, increasingly, with electronic pumps. I’ve now run multiday events with and without an insulin pump. When I took on the 186-mile Marathon des Cote [MdC] in June 2018, I was on a mix of slow release Levemir and fast acting Novorapid in five or so shots a day. Five months later, I ran the 84-mile Druids Challenge with a pump delivering Fiasp insulin through a cannula under the skin. It’s only now that I have a pump that I realise how the odds are stacked against you if you attempt any sort of endurance race while on insulin injections, rather than having it drip fed via a pump. It’s like trying to run with your shoelaces tied together. Have a look at my blood sugar levels for the first day of MdC (below) for proof. Spot the sky high 20 millimoles per litre (mmol) plus readings for the first few hours of the MdC. 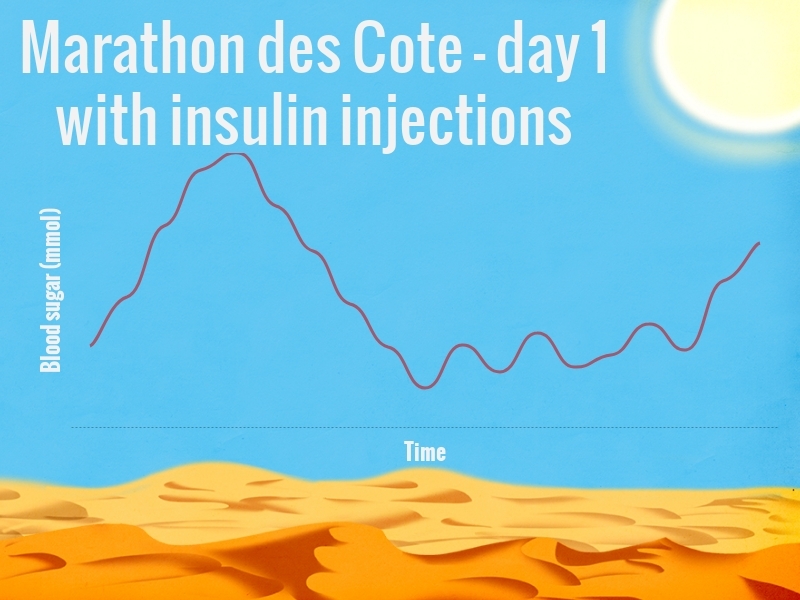 It’s usual to get a spike before a race – all the excitement results in a release of adrenalin which prompts the liver to release glucose – but these were unusually high, hitting 27mmol. For context, a non-diabetic’s levels would usually be between four and eight. High blood sugar makes you feel like crap. Energy levels drop because the glucose your cells need as fuel is trapped in your blood. You develop an unquenchable thirst and constantly need to pee as your body tries to jettison the excess sugar. Without insulin, your body burns fat as fuel, releasing substances called ketones into the blood. If untreated, a condition known as ketoacidosis develops. The blood turns acidic. Eventually you die a horrible death. So, making sure you have enough insulin on board is a big deal. Not too much, mind you. That causes blood sugar levels to drop. So too can prolonged exercise, as the cells require more glucose from the blood as fuel. If blood sugar level drops too low, too quickly, you go into state known as hypoglycaemia (or ‘hypo’). You become confused and weak; you can pass out and start fitting. It’s not pretty. Especially if you’re deep in the Sahara Desert. Timing is everything when it comes to keeping your blood sugar in that sweet spot between four and eight mmol. But the variables that affect how quickly insulin starts working and food is digested are innumerable. Exercise increases your sensitivity to insulin and speeds up the rate at which the body burns food as fuel. Extremes in temperature, adrenalin and a tonne of other factors also come into play. Working it all out is a nightmare. My blood sugar hit such dizzy heights in the first few hours of the MdC for a number of reasons. First, there was the adrenalin. Then there was the 50% cut to my dose of Levemir (slow acting insulin) to counter the effect of the 60 miles I was due to run that day. Finally, there were the two porridge pots I ate at 3.30am in anticipation of the planned 4am start. I didn’t take any (fast acting) Novorapid with these, knowing that I had some Levemir on board and that the body can convert some sugar to energy without insulin when exercising. Thing is, we started running 30 minutes later than expected due to a mix up with one of the other runners. In that time, my body was converting all those oats into glucose that had nowhere to go when it hit my bloodstream because I didn’t have enough insulin on board and I wasn’t running. Plus, the adrenalin was building, causing my liver to release yet more glucose. I’d usually inject Novorapid to counter this, but couldn’t now because it wouldn’t have started working until I was running, putting me at risk of hypoglycaemia. That I did 26 miles and about 1,500ft of ascent along the Pembrokeshire Coastline before my blood sugar dropped to a normal level is quite an achievement, if I do say so myself. 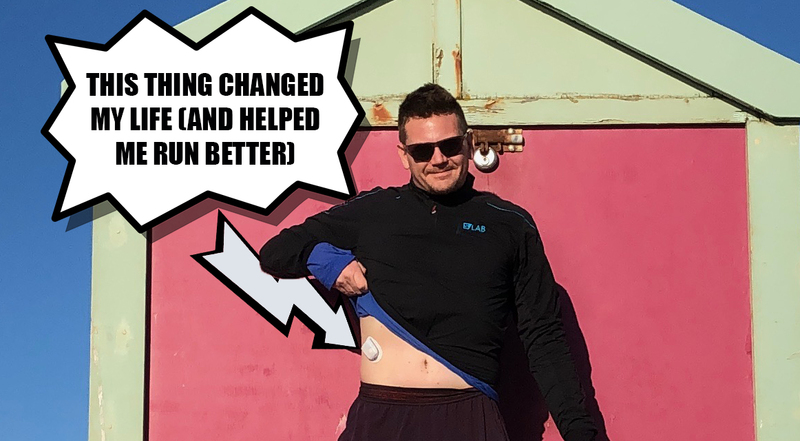 But if I’d had an insulin pump during the MdC it would have been another story. Compare the first day of the MdC’s levels with the first day of Druids (below) for proof. Sure, I still went high at the start of Druids, which kicked off at a much more civilised 11am on the first day. But because I was using a pump with Fiasp insulin, which starts taking effect and leaves your system far more quickly than Novorapid, I was able to take a small amount of insulin to counteract this spike, meaning my level topped out at 13.5 mmol rather than 27. As a result, I felt less like crap and could run faster (not that much faster: I’m built for comfort, not speed). Another huge benefit of the pump is that it means you don’t need to take any long acting insulin, which I took in two daily shots before switching. So-called basal insulin is a blunt, inflexible instrument. When taking part in prolonged exercise you need to reduce the amount you take to avoid hypoglycaemia, but as my experience at the MdC shows, this can also cause blood sugar to rocket when you’re not exercising. 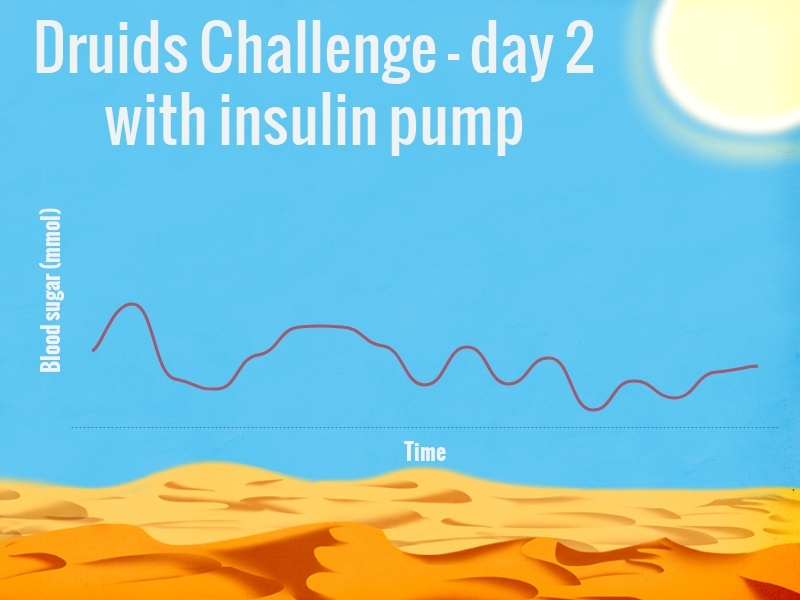 The beauty of the pump is that you can vary your basal rate (the amount of insulin it drip feeds you every hour) depending on what you’re doing. If I cut my basal rate about an hour before I start running and keep it at about 20% of my usual rate throughout the run, I get much tighter control (see the much smoother lines in the graphs for Druids). When I stop running, I increase it again. Sorted! Not quite. A pump isn’t a pancreas. It takes a lot of trial and error to work out how to vary insulin dosage when running seven or more hours a day. I had numerous hypos throughout Druids weekend (see the dips in the above graph). I passed out twice but, thankfully, came around and was able to administer my own glucose to bring my blood sugar back up and keep running. These lows were mostly down to upping my dosage after stopping running to counter the lack of insulin in my system from the day’s exertions. Clearly, the doses were too high, causing my blood sugar to sink (I hit a dangerous 1.7mmol on the second evening). 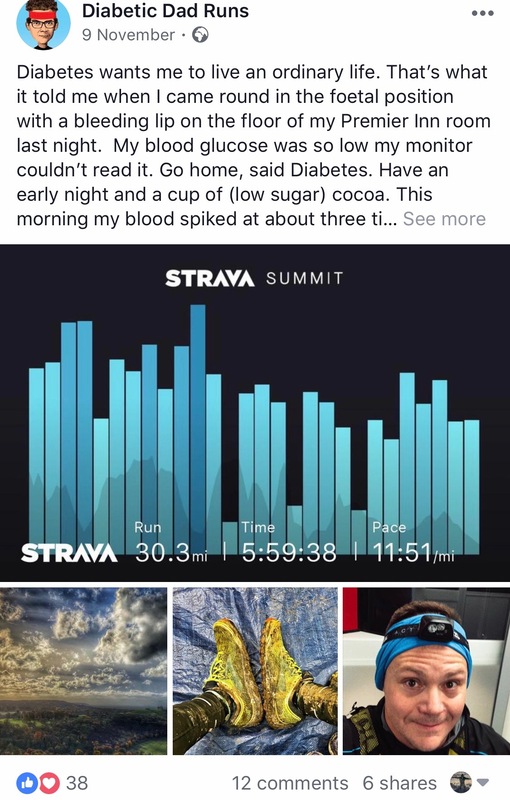 During the MdC, my blood sugar went in the other direction in the evenings, soaring into the 20s because of the lower levels of basal insulin I’d taken to avoid going low while running. Running with type 1, like life with type 1, is a balancing act. An insulin pump helps give you greater stability, but it still takes practice to get it right. My next experiment is in a few weeks, when I take on the two-day, 66-mile Pilgrim Challenge along the North Downs Way. After that, it’s 78 miles in three days along Dorset’s Jurassic Coast. Then, in April 2019, it’s the big one: 150 miles in six days across the Sahara Desert in the Marathon des Sables. Follow me on Facebook, Twitter and Instagram to see how I get on. I’m doing all this to raise funds for Diabetes UK, which helped make insulin pumps available on the NHS in Britain, JDRF, which funds research into new treatments and a cure for type 1 diabetes, and T1International, which campaigns for the 50% of the world’s diabetics that live (and die) without adequate access to insulin. Please share quid/dollar/euro/whatever, here.